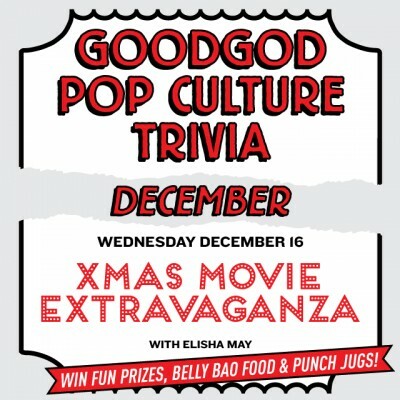 Tis the season to be bingeing on Home Alone, Love Actually, Nightmare Before Christmas...fruit cake…mince pies…ham..
It’s the year-ender trivia night and to thank you all for giving us another great year of fandom-filled trivia, we will be throwing a night of fairy lights, off-key carols, unrealistic holiday movie romances and a bar full of rum! Before you get on that Countrylink train back home to your relos, indulge in one more Wednesday night with Elisha May for some cinnamon-sprinkled Baileys and Macaulay Culkin. 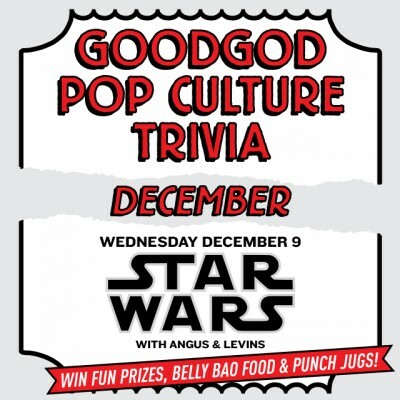 We will list movies that will be covered in trivia, but if you have any requests, feel free to post on the wall. Prizes and presents wrapped in festive paper will be given away! Even your BellyBao fried chicken will be wrapped in festive paper! Not much need be said. Not much can be said. DISCLAIMER: Goodgod Smallclub is not a galactic battlefield for original vs new trilogy purist wars. We just want to promote galactic peace, man. Come and enjoy it like we’re all just kids again! Sponsored by Goodgod Smallclub, Belly Bao and the Galactic Empire. 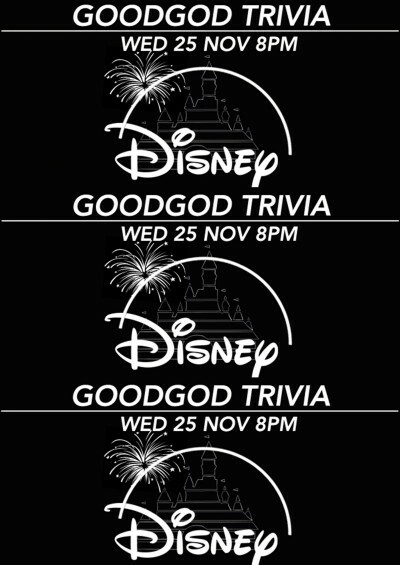 On the 2nd of December, we will be hosting the 1st ever Goodgod Hunger Trivia. The reaping will take place beginning today. 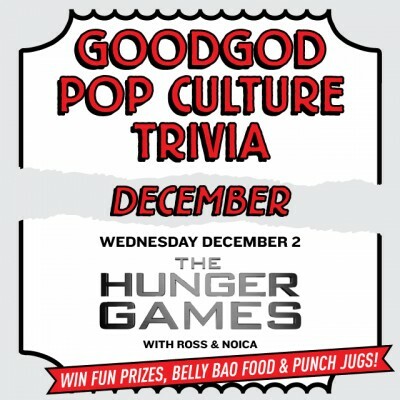 In a week’s time, all tributes must come to the Goodgod Front Bar-ena. Make sure to come dressed in your best outfits to impress the sponsors. Weapons and pens will be provided in the games. Victors receive a lifelong allowance for smugness knowing that you know everything there is to know about a girl with a bendy stick and plenty of other pointy sticks and a game where kids beat each other up. Please note: The questions will be mostly from the movies, but also some from the books. Brought to you by Goodgod Smallclub and Belly Bao. Oh! What wonderful day to be alive! Mixing mixed drinks and mixed emotions with mixed melodies and mixed media that create the perfect animated magical fantastical Disney celebration! Elisha May will be spreading the bibbity-bobbity-boos all around with questions from cel classics like Dumbo and the Dalmatians as well as the newer Pixar ones like Inside Out and Toy Story. You can expect to find your princes and princesses come to life alongside the talking toys, animals and monsters! As always, come down early! First come, first served! Doors open at 5 and trivia starts at 8. Prizes as traditional are classic Goodgod punch jugs, Belly Bao chicken and snackles, and some fun prize packs...and Elisha always scatters around magical candies to fuel your magical spirit!